November is Prematurity Awareness Month, started by the March of Dimes to bring awareness to the effects of premature birth in the U.S. The hope is that by spreading awareness through education, the number of premature births will be reduced and lives will be saved. It is a significant problem, as according to the 2014 National Health Review Survey, 4.7 percent of women between the ages of 18 and 39 self-reported having trouble hearing without hearing aids. It is important to note, however, that while there is a correlation between hearing loss and higher rates of pre-term birth/lower birth weight, the relationship is not one of direct causality. In other words, it is the circumstances surrounding those with hearing loss, and not the hearing loss itself, that leads to the early births and low birth weights. As for the reasons behind the correlation, previous studies might have revealed some answers. For example, in 2006 researchers at the University of Rochester conducted a survey of both deaf and hearing women, and found that deaf women reported fewer prenatal visits and lower levels of satisfaction with their healthcare than the hearing women. More recently, researchers at the Lurie Institute for Disability Policy at Brandeis University took note of that information, and also saw that there were no population-based studies on pregnancy outcomes among women with hearing loss. As a result, the researchers at Brandeis decided to follow up with their own study. 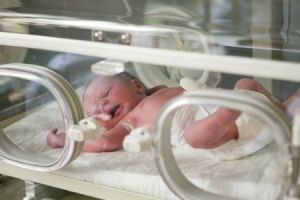 The new study looked almost 18 million births nationwide between the years of 2008 and 2011 using data from the Nationwide Inpatient Sample of the Healthcare Cost and Utilization Project (HCUP). Out of those 18 million births, approximately 10,500 were to women with hearing loss. The results of the study revealed that rates of both pre-term birth and low birth weight were significantly higher among women with hearing loss than in the general population. The study also showed stark differences in health insurance between those with hearing loss and those with normal hearing. Among women with hearing loss, Medicare and Medicaid were the most common payers for those who gave birth in hospitals; yet among women without hearing loss, private insurance was the most common payer. Medicare paid for the births of 13.3 percent of women with hearing loss, yet was only called to cover .6 percent of births by women without hearing loss. Another factor that affects birth outcomes is the ability to communicate effectively with healthcare providers. The reality is that very few healthcare providers receive adequate training as to how to best communicate with those who are deaf or have hearing loss, and this includes those who provide prenatal care. It is the circumstances surrounding mothers with hearing loss, and not the hearing loss itself, that leads to the early births and low birth weights. Prior health also comes into play when it comes to birth outcomes, and deaf people or those with hearing loss are more likely than others to have two or more coexisting health issues. Also, having hearing loss can negatively impact opportunities for learning about healthcare, whether those opportunities come in the form of a radio or television ad, a public service announcement or other forms. "Given the earlier studies on patient-provider communication, potential biological factors, interpersonal violence, and health knowledge and health literacy among people with hearing loss, and the general dissatisfaction of people with hearing loss with their healthcare, these factors could potentially explain the poor birth outcomes found in this study," said Monika Mitra, PhD, Associate Professor at Brandeis and lead investigator on the study. The hope is that going forward, the results of the study will lead to better understanding of the factors that lead to pre-term birth and low birth weight for babies born to mothers with hearing loss. The outcome of improved maternal healthcare programs and better communication between healthcare providers and their patients is an admirable one.